Clyde Hoey asks Josephus Daniels to clarify whether Herbert Hoover ever called on Woodrow WIlson during his illness. I have been right reliably informed that, although Mr. Hoover was a part of the Wilson administration, after President Wilson retired from the presidency on March 4th, 1921, that Mr. Hoover never even called by Mr. Wilson’s home to see him at any time during his sickness. I have been further advised that Mr. Hoover lived on the same street, or not very far distant from Wilson’s home, after moving to Washington as Secretary of Commerce, and that his failure to call on President Wilson was a subject of comment by Dr. Grayson, in which he criticised him very severely. I am wondering if you could ascertain from either Mrs. Wilson or Dr. Grayson if this is true. The development of this fact, if it is a fact, would tend to relieve Hoover of a large measure of the Wilson support in North Carolina and would tend to reveal him as a very cold, indifferent sort of man, lacking in those human qualities which men, and especially women, like to see in public men. I do not wish to mention this matter in any speech unless I know that it is correct and I felt that you might be able to ascertain the fact about it. I congratulate you on the active service which you are giving the party and I think your interview in New York should be especially helpful in North Carolina. I am anxious to see the party get the right swing in the State and I do not know any man who can give it that swing quite so effectively as you can. 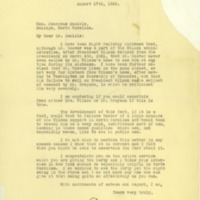 Hoey, Clyde Roark, 1877-1954, “Clyde R. Hoey to Josephus Daniels,” 1928 August 17, WWP16620, Cary T. Grayson Papers, Woodrow Wilson Presidential Library & Museum, Staunton, Virginia.